All Joan Jett items listed below are authentic and very limited. We do not carry multiple items. All prices and availability are subject to change. All prices include shipping and handling for all USA customers. All other destinations will require actual shipping cost to complete transaction. Have a question? Ask us before purchasing the item. Thank You. 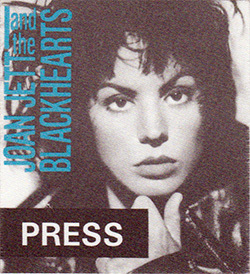 Description: 1992 Joan Jett Notorious Press Pass. Pass is peeled with paper backing. 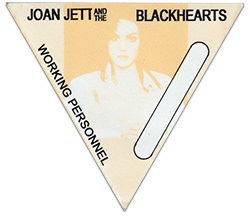 Description: 2006 Joan Jett Sinner Working Personnel Pass. Item in VG+ condition. 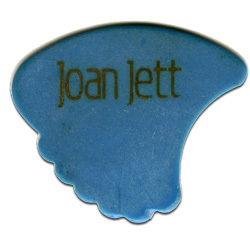 Description: Joan Jett Concert Guitar Pick Imprint Shark Fin. 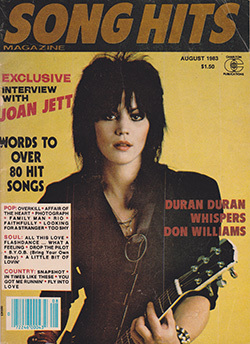 Description: August 1983 Song Hits Magazine Featuring Joan Jett Interview. VG+ condition.